ERCOT’s Technical Advisory Committee last week endorsed a staff suggestion to increase by 50% the boundary thresholds used to project future loads in Far West Texas. During the committee’s last meeting of 2018, stakeholders unanimously approved the recommendation, which, assuming Board of Directors approval, raises the Far West weather zone’s boundary threshold from 5% to 7.5%. The change would allow ERCOT to nearly double the Far West load from its current 3.6 GW to 6.9 GW in 2027, and support 500 MW of growth for 2019-2021 without supporting documentation. The growth has been fueled by the Permian Basin’s rich petroleum reserves, the largest in the U.S. Production has nearly doubled in the last three years, to 3.4 million barrels/day. Oncor’s Martha Henson (foreground) prepares to deliver the Protocol Revision Subcommittee’s report. Staff said it has been challenged in keeping up with the load growth. 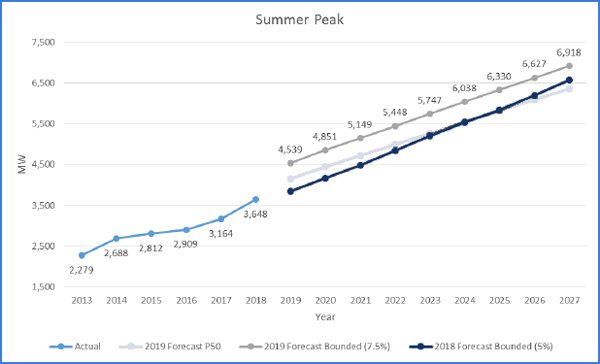 The grid operator adjusted its 2019 forecast by 200 MW to keep up with the rapidly increasing demand, and it foresees about a 500-MW increase over the 2018 summer peak (consistent with a similar increase as compared to 2017). “We’ve understated the Far West load the last two cycles,” said ERCOT’s Calvin Opheim, manager of load forecasting and analysis. He told the TAC the ultimate goal is to produce more realistic projections. Permian production has been hampered recently by a lack of sufficient pipeline infrastructure. Falling oil prices have also made production less economical, leading some stakeholders to question the need to increase forecasts. “Our concern is whether [the suggested change to the forecast process] results in building transmission for speculative load,” Golden Spread Electric Cooperative’s Mike Wise said. He referenced a recent ERCOT regional transmission study that forecasted increased load based on rising oil prices. Reliant Energy Retail Services’ Bill Barnes noted that a two-year revision to the planning guide (PGRR042) gives staff flexibility while establishing a methodology for setting their load forecasts. “Having ERCOT understand load growth is a good thing,” Barnes said. Stakeholders endorsed staff’s recommendation to not change how ERCOT computes regulation and responsive reserve service as part of its 2019 ancillary service methodology, after first removing a 1,375-MW floor on non-spin quantities during peak hours. 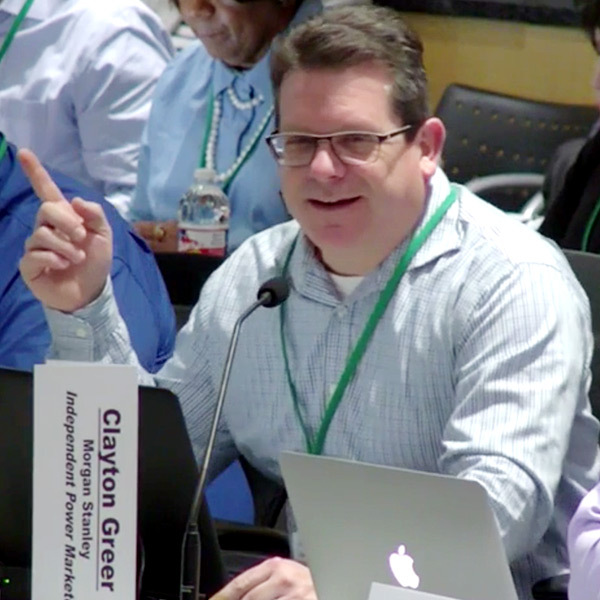 Morgan Stanley’s Clayton Greer speaks out against the non-spin reserves’ 1,375-MW floor. The Wholesale Market Subcommittee and Reliability and Operations Subcommittee (ROS) have both suggested removing the floor during the hours ending 7 a.m. through 10 a.m. The Lower Colorado River Authority and Luminant were among the TAC members asking that the floor be maintained, saying it would provide more reliability insurance with the growth of volatile wind generation. However, a motion to remove the floor passed with 71% of a roll call vote. The committee then endorsed staff’s recommendation, with two abstentions. Sandip Sharma, ERCOT’s manager of operations planning, said the 1,375-MW floor has been in place since the nodal market went live in 2010. The grid operator removed a 2,000-MW cap on non-spin reserves in 2016 but left the floor unchanged. 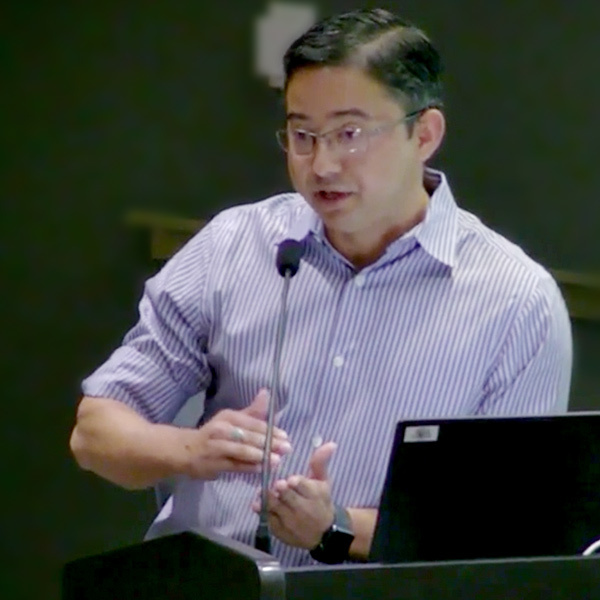 Citigroup Energy’s Eric Goff said that during the summer months, non-spin deployment “generally” means generating units are turned on and made available for security-constrained economic dispatch (SCED) at a price floor. Stakeholders confirmed new leadership for the ROS, which develops, reviews and maintains operating guides and planning criteria. Tenaska’s Boone Staples was approved as the ROS chair, and Southern Power’s Tim Hall as vice chair. 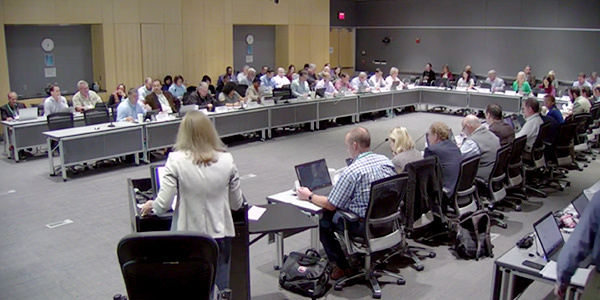 Having not met since September and facing a year-end deadline to push through change requests, the committee considered 31 proposed Nodal Protocol revision requests (NPRRs) and other changes. The NPRR introduces new terms to clarify the distinction between transmission-connected resources and distribution-connected resources, and reorganizes various terms for resources that describe the status, services provided and/or technology used by resources. Stakeholders agreed to table two other revision requests for a month and allow their further consideration. South Texas Electric Cooperative’s Clif Lange asked for more time to “discuss internally” with staff the co-op’s reliability concerns about NPRR871. The proposed change addresses the review process for transmission projects funded by customers or resource entities, using language pulled from NPRR837’s initial filing to allow for a standalone review. NPRR837 was approved in July. The committee also tabled NPRR850, referring the proposal to the Credit Work Group and Market Settlements Working Group. The change would lay out principles for staff and market participants to follow during a market suspension and restart, and specifies how settlements will occur during a suspension. NPRR878: Prescribes ERCOT’s posting of an emergency response service obligation report for transmission and/or distribution service providers to the market information system certified area. NPRR879: Proposes that intermittent renewable resources (IRRs) carrying ancillary service (AS) responsibilities receive a SCED base point calculated using the resource’s five-minute intra-hour forecast and adds generation resource energy deployment performance metrics to score performance during those intervals. The change corrects the unit of measure for some billing determinants and also contains administrative edits. NPRR881: Reduces the residential validations requirements from an annual process to a triennial market event. NPRR882: Updates the definition of initial synchronization and interconnecting entity to include certain types of facility equipment changes and clarifies fee language related to generation interconnection or change requests (GINRs). NPRR884: Introduces various systems changes needed to manage cases when ERCOT issues a reliability unit commitment instruction to a combined cycle generation resource that is already qualified scheduling entity-committed for an hour. The resource will operate in a configuration with greater capacity for that same hour. NPRR887: Creates a new market information system certified area posting that provides insight into the potential risk associated with each counterparty’s default uplift charges. NPRR892: Places a $75/MWh floor on energy on units carrying non-spinning and responsive reserves and/or regulation-up service concurrently to ensure the non-spin capacity is priced above the floor. NPRR893: Clarifies the effective fuel index price (FIP) used in market activities executed prior to the operating day’s index publication because the current FIP definition does not address the timing around receiving the data and when it can feasibly be used by market applications. The NPRR also incorporates the OBD “System-Wide Offer Cap and Scarcity Pricing Mechanism Methodology” into the Protocols. NPRR894: Corrects the formula for allocating unaccounted for energy (UFE) to UFE categories by removing its obsolete components referring to distribution voltage level non-opt-in entities. NPRR895: Removes the current exclusion for IRRs that are not wind-powered generation resources in calculating the real-time AS imbalance payment or charge. Photovoltaic generation resources (PVGRs) are currently excluded in both the methodology for implementing the operating reserve demand curve (ORDC) to calculate the real-time reserve price adder and the process for settling the real-time AS imbalance payment or charge. NPRR897: Adjusts the black start service procurement and testing process timeline, adds a weather limitation disclosure form and aligns the load-carrying test procedure with actual practice. NPRR898: Allows the electronic return of ERCOT-polled settlement metering site certification documents to the transmission and/or distribution service provider. NPRR899: Creates a new process by which qualified market participants can request to opt out of receiving digital certificates and having to appoint a user security administrator (USA); clarifies ambiguous requirements certificate holders must meet to receive and continue to hold digital certificates; and clarifies that a USA may be responsible for managing access to certain ERCOT computer systems that do not require digital certificates. The NPRR also revises forms to give new applicants the ability to opt out of receiving digital certificates as long as they meet the necessary qualifications. Allows a qualified market participant that has previously opted out to opt back in. NPRR901: Proposes a new resource status code (“EMRSWGR”) for switchable generation resources operating in a non-ERCOT control area to provide additional transparency for operations and reporting. LPGRR065: Related to NPRR881, this change reduces the residential validations requirements from an annual process to a triennial market event and removes unnecessary load profile model approval process language. NOGRR178: Clarifies language relating to automatic load shedding. NOGRR182: Harmonizes the transmission operator emergency operations plan submittals with NERC Reliability Standard EOP-011-1 by clarifying that TOP plans should be received by Feb. 15 as part of the annual effort to review them within 30 days. OBDRR006: Aligns language with NPRR884’s protocol changes. OBDRR007: Changes the ORDC’s methodology to consider curtailed PVGRs in determining the ORDC price adders. OBDRR009: Revises the online and offline capacity reserves for ERCOT out-of-market actions related to DC ties. PGRR065: Documents and clarifies existing processes by including transmission project information and tracking report and data requirements. PGRR066: Creates an inactive status for GINR projects that won’t be listed in ERCOT’s monthly generation interconnection status report but will retain the interconnection request numbers. The PGRR also defines a process that can be used to cancel interconnection requests that have failed to meet requirements. PGRR067: Describes how wind and solar facility equipment changes are treated throughout the generation interconnection process and clarifies language for GINR-related fees. RMGRR155: Related to NPRR889, the change uses the new term settlement-only distribution generator (SOG) to replace references to non-modeled generator and registered distributed generation. RRGRR018: Also related to NPRR889, uses the SOG term to replace glossary references to non-modeled generator. RRGRR019: Adds a modeling designation for switchable generation resources (SWGRs) to the resource asset registration form, indicating that SWGRs can potentially operate in another control area. SCR797: Allows ERCOT to automatically share current operating plans with a transmission service provider (TSP) upon request by that TSP.